It is finally time for educators across the state of New York to head back to school. Here in the city, we have one day to organize, get our rooms situated, be professionally developed, catch up on the summer on-goings of our colleagues, and be ready to open our doors and welcome our new students full with promise – tomorrow. So, as I let this ruminate; I find myself referring back to an article I was sent this summer to keep my mind whirling and my thinking on the edge. Why are students falling off track? According to this piece from Education Week the gap that separates students from achieving academic success is staggering. This is not news. However, as I have had to arduously undergo this move of 3,000 books and their accompanied bookshelves (the entire Francis Gittens Lending Library) from room 382 to room 369; much has come to light. I’m no stranger to believing that literacy is the key to access, opportunity, and self-worth; or that the Readers Writers Workshop is the venue in which to do so. Yet, this experience — this move, has taught me even more. Literacy needs to be passed on. It cannot remain only within our classrooms or the classrooms down the hall. It must be infiltrated into the homes in which our students live; brought with them on public transportation where book covers are viewed by others; shared with siblings. It must continually be invited and welcomed into places it does not often find an invitation. That’s our job as educators. 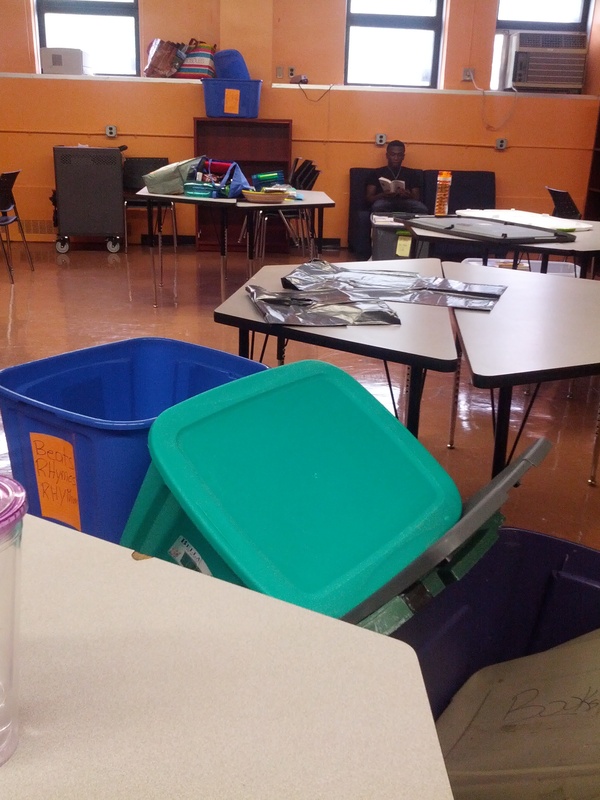 So when Daphtho and George (two recent graduates) offered to spend their time among the heat, lifting and moving and organizing and undoing and reorganizing and waiting (for me to make aesthetic decisions); they quietly schooled me. Through their actions they showed me that when we are relentless in supporting their thinking and ideas, when we foster them as individuals (not just students) they innately become the young men and women they are destined to become. They are willing to give back to their community (even if they are no longer going to be physically present). They understand what it means to feel safe to take risks, comfortable to allow vulnerability to surface, and the power of giving back. And, are eager to pass it forward. During the many hours of this move, there were quiet (if not silent) moments of understanding. 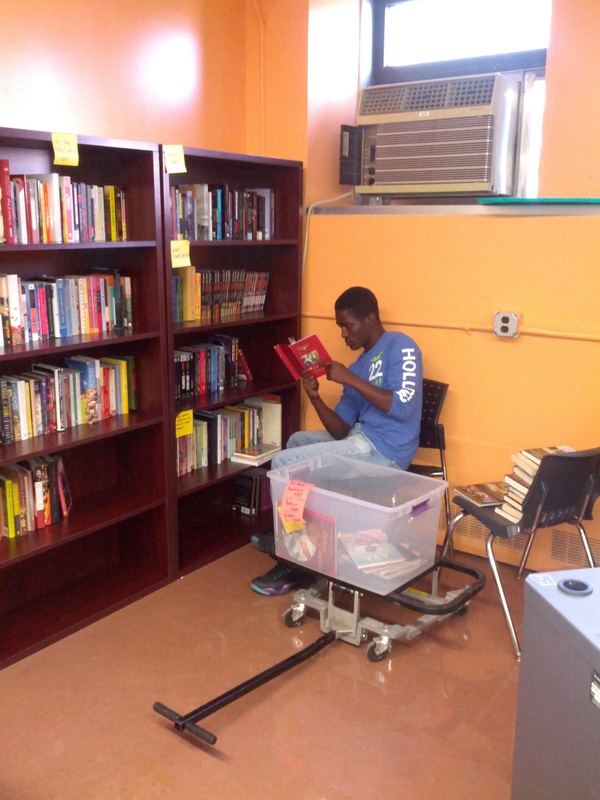 Albeit the towering stacks of boxes that needed unpacking, these young men stopped in their tracks as they found literature that spoke to them – and found themselves comfortable spaces in which to explore. Daphtho will be bringing literature home for his brother entering sixth grade as he works side-by-side with him on his literacy skills (knowing the importance of a strong foundation) and George decided on two pieces that were donated by a friend of mine from high school – ponderings and questions about taking the next steps in our lives. What elements of the Readers Writers Workshop do you believe propels your students in becoming robust citizens? Moving can be so overwhelming. The fact that you were able to find moments of beauty in a move is amazing. Congratulations on building such a beautiful library. The connection students have to it and to their own literacy is clearly a reflection of the tremendous work being done. 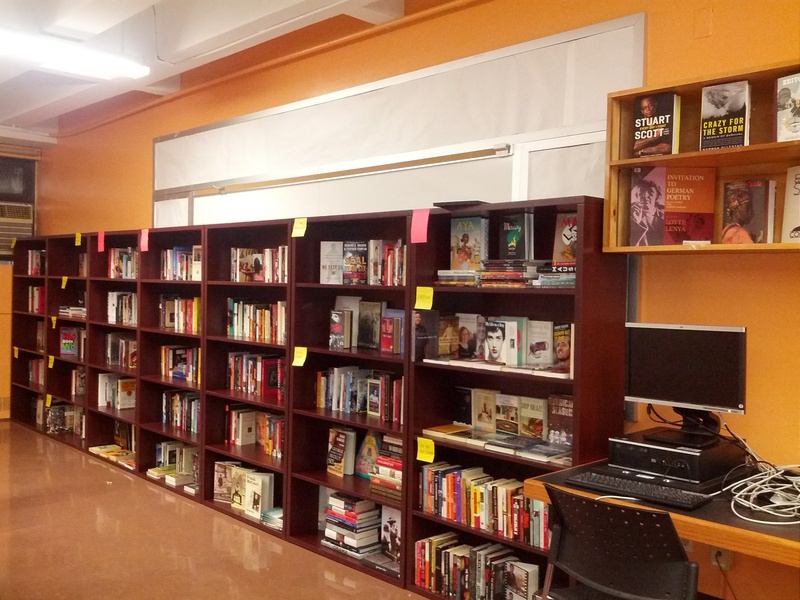 Enjoy the new space and the start to a new year! “They quietly schooled me.” What a lovely line. This whole piece is very sweet, as Amy aptly states. What a sweet reflection, BK. Thank you for sharing.